Hi friend! I hope you’re having a splendid week! I’m so glad to be back blogging after a bit of a hiatus this August. I’ve got tons of recipes and articles coming your way this fall, so if you aren’t on my mailing list yet, head on over here to sign up, receive a free e-book, and never miss another blob post again! Now that summer is coming to a close, I’ve been in the mood to start incorporating more warming foods into my diet and this delicious rice fits the bill. 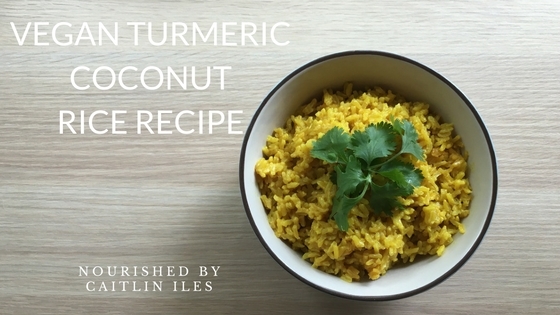 It combines the anti-inflammatory power of turmeric with the fat-burning power of coconut milk to create the best stir-fry or rice bowl base around! It’s super easy to make and goes GREAT with my favourite Glory Bowl Dressing Recipe and you can even top it with some Lemon Roasted Broccoli and a spoonful of Carrot Ginger Sauerkraut to get a really delicious flavour combo and gut healing benefits! This recipe is designed to be a blank canvas that you can get creative with, so have fun and experiment. Let me know your favourite ways to use it in the comments below. Now without further ado, here are the goods! In a medium saucepan whisk together all ingredients. Cover with lid and bring to a rolling boil. Once boiled turn off heat, or reduce to simmer depending on the heat of your stove elements, and let sit, covered, for 25-30 minutes. DO NOT OPEN LID! After 30 minutes remove lid, fluff with fork, and enjoy! Well friend, that’s our delicious recipe for today! I hope you enjoy eating it as much as I did. If you’re looking for some support as you reconnect with your health goals this fall make sure you sign up for me Reset Yourself Nutrition Challenge starting September 12th. It’s going to be a blast! Check it out here.